If you don't have experience with the print world you might find out that your business card you just printed might look quite different than what you saw in photoshop (or any other software you use). If you have been smart enough, the print you got is just a proof and now you can make some corrections to your design and send it again for another proof. But before sending your file again read this post: here I want to share with you some tips I just learnt recently while designing my card. Unless you have a very good reason, stick to the standard business card size. You don't want your business card to not fit in someone's wallet or pocket, do you? 2. Why CMYK instead of RGB? If you are a web designer and you don't know much about the print world you might be used to work in RGB colour mode (I hope at least you know what RGB does mean!). If you send an RGB file to print it will be converted to CMYK before being printed. The result might look quite disappointing since CMYK as a much restricted colour gamut (that means the available range of colours). 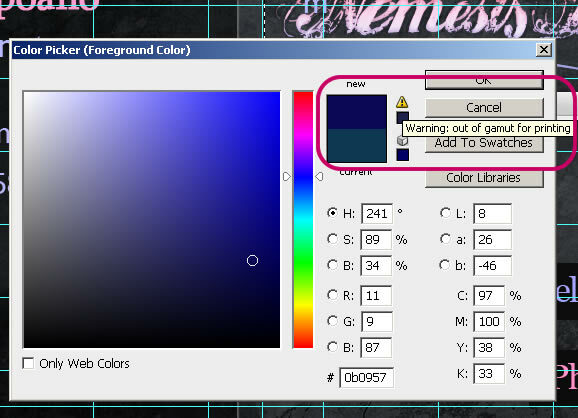 So if you don't want to have surprises work in CMYK and pay attention when you chose a color, photoshop will tell you if it's out of gamut for print, see the image above. The bleed is an extra part that will be cut out. This is important because introduces a margin of error in the cropping step of the final prints. Most print shops where I am now (Spain) require a 3 mm bleed, that is 0,3 cm and 35 pixels. 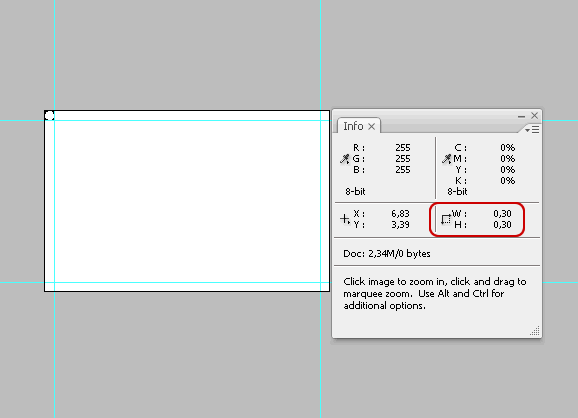 With the "Rectangular Marquee Tool", while holding the shift button, draw a square of 0,30 cm wide and high starting from the top-left corner. Insert two guides that coincide with the marquee edges. Move the square marquee to the bottom right corner and do the same. Here it is, now you have a bleed! Remember that the part between the guides and the borders will be cut out. For a better aesthetic and harmony, keep at least another 0,35 - 0,40 cm from the bleed guides. This is the most important element to care about when designing a business card. You don't want your clients to struggle when trying to read your contact details, do you? Consider 1 point more if you're using a dark background. Be sure the fonts you are using are designed for print. At same size, some fonts tend to print smaller compared to others. So be sure to test your design before sending it to print. I think all print shops let you do one or two print proofs - for free - before printing hundreds of business cards. Take advantage of this opportunity and make sure you like your proof. If you want to save time, you can even print it with your office printer before printing a proof at the shop. In some cases, from a colour point of view, the final print can look quite dull and disappointing, especially if you converted a file from RGB colour mode. If your print proof look a bit dull or dark, try to increase the colour saturation a bit. This can be done either by adding an "Hue / Saturation" adjustment layer or, if you want more control, by chosing more saturated color for each element of your design. On screen it will look a bit too much maybe, but the final print will look much better. Ensure the text colour has a good contrast with its background colour. If you struggle reading your text try adding a rectangle sized background of a contrasting colour to improve its readability. 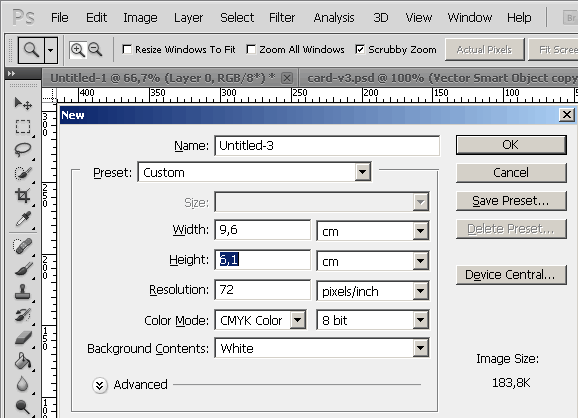 Here it comes a rule that is valid for everything, web-design, programming, and print-design: just Keep It Simple. 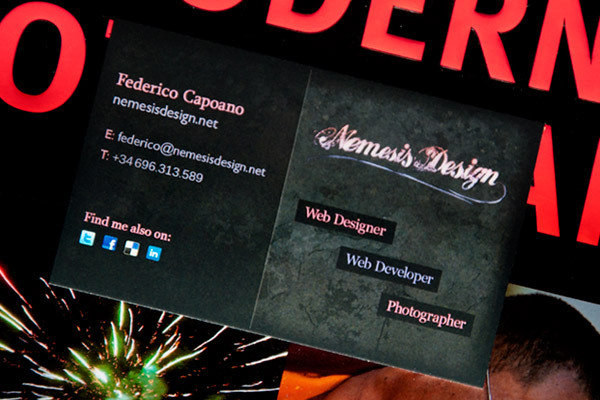 Do not over-design your business card. Too much detail might give poor results on paper. "Rules Are There To Be Broken"
I read a lot of guidelines and rules over the internet about this topic. But not every rule is universal, for example while most people advice to write all your contact information on your business card I didn't write an address or a landline phone number on it. The reason is simple: in the last 2 years I have moved 6 times and switched between Italy and Spain 3 times, if that would happen again what would I do? Throw my business card and print them again? What if someone has still my old business card and decides to call me or come to see me? Other articles suggest to people that work in two countries to use both languages on a business card, but come on that would look ugly. I work with people from all over europe, what the hell should I do write my card in 3 languages? Italian, Spanish and English? No thanks. Maybe one day I'll print 3 versions instead if needed - but I doubt it. So to hell all those rules and have fun while designing your card! “One of the quality article that can be useful for people willing to print business card design for their daily routine life. “simple,short,and not uptight,just the way tips should be!